“Moose! Moose! 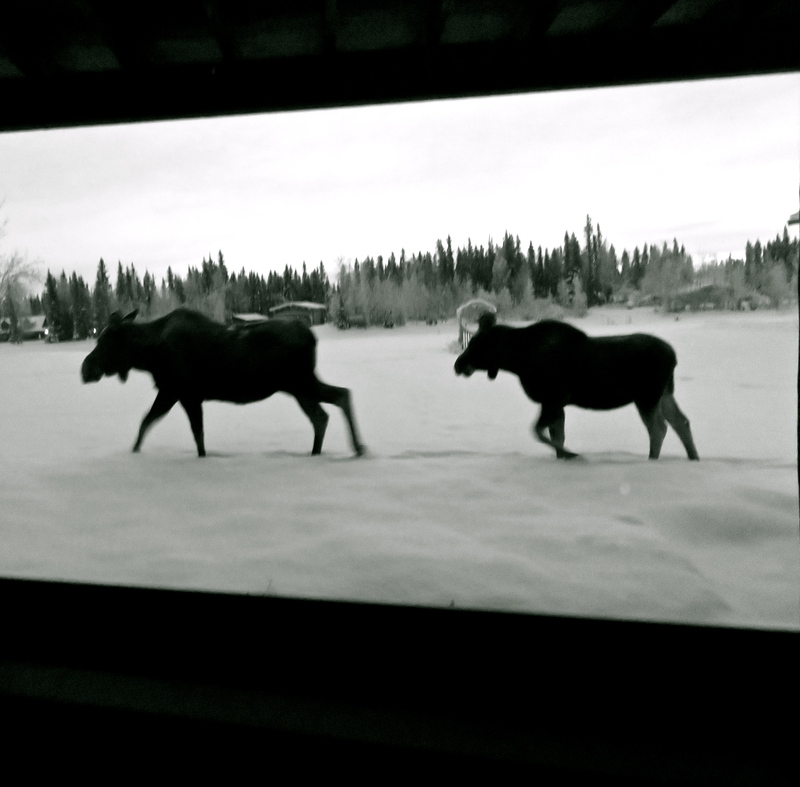 There’re two moose!” R shouted. He never shouts, so I had a flash of a thought of that somebody’d left the front door open and a couple of thousand-pounders had wandered in out of the cold. “Where?” I shouted back from under my comforter where I was sipping a second cup of coffee and reading Alaskan author extraordinaire John Haines’ Living Off the Country: Essays on Poetry and Place. I ran into the extra bedroom R uses as his office when we live at my daughter’s home in Fairbanks. 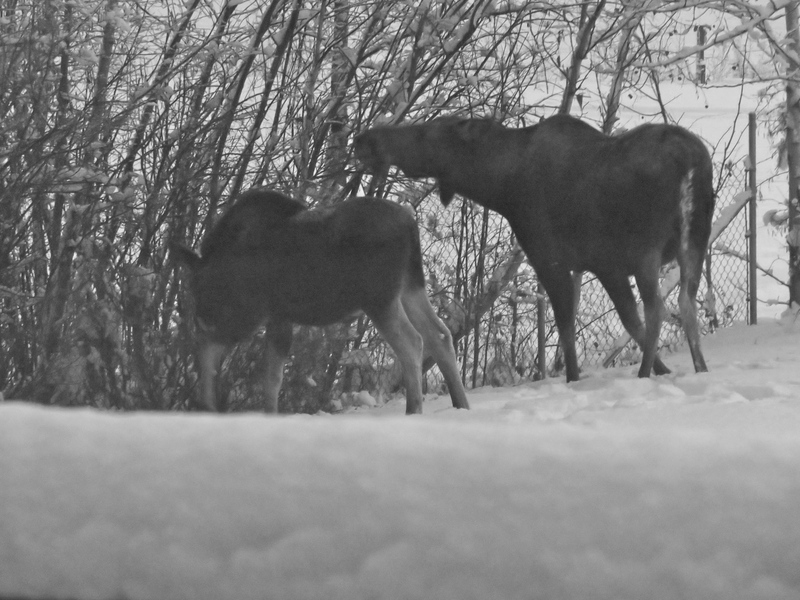 Just outside the window (and hard to see because the sun, at 9:30 in the morning, was not due to rise for another 40 minutes) were a mama moose and her yearling hoofing slowly through the snow. They paused, and looked directly at us. For a long time. It was weird. I ran for my camera and snapped away until they moved on. It’s not like Alaska isn’t wilderness – it mostly is. But most Alaskans don’t live in the wild. They live on the edge of the wild in towns with schools and cable TV and stores and dentists and roller rinks sometimes. It’s just like any place else, only with mountains and moose. A sign of a baby on the way . . .
My husband’s family lives in Maine, so we have that moose book by Arlo Guthrie. Love it! They’re pretty amazing creatures, aren’t they. Don’t look like they’ve ever gone anywhere in a hurry. I love your photos! They’re definitely taking their time. 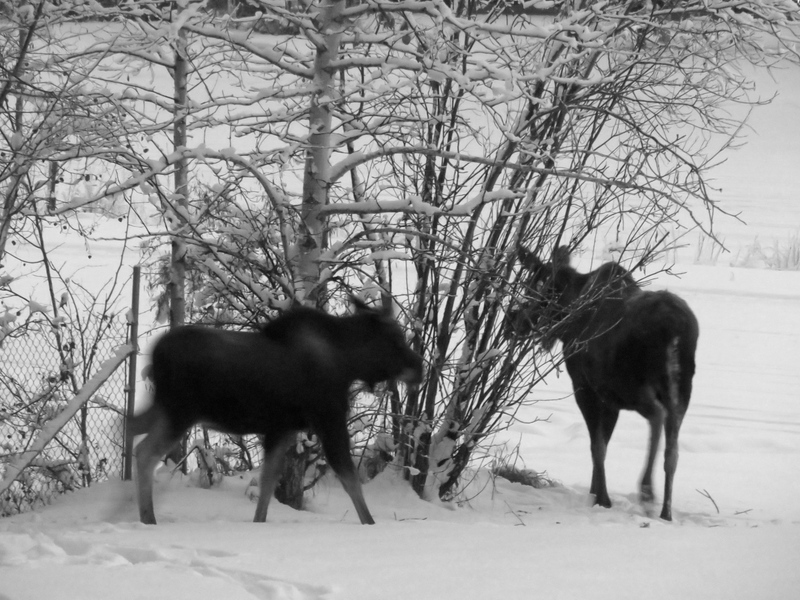 It’s amazing how moose can shuffle around, live on twigs and, being so large, survive the winter. Thanks, Jilanne. How I love that you call each other darling… how I love moose… how I love your writing! It always makes me smile. Ah, you’re adorable, Dawn! Makes me happy to read your sweet words and, for some reason, the image of Bullwinkle just popped into my head. I loved that moose! Thank you. Such an amoosing blog my dear! Great photos.